Yowser.... it's a bit chilly outside.... (feels so darn great)!! I love this time of the year... I call it SWEATSHIRT WEATHER!! There is nothing like the smell of cool, fresh air! Well... my hubby has joined our local gym...just up from our house. He has been so good in attending. Yesterday he met with a trainer and he's on the right track now... using the equipment properly and understanding what each of them do. He started out on his own and was doing TOO MUCH! You can imagine how that thrilled him! I'll keep you up on his progress! The hardest step is over...getting up and going! I was reading Facebook this morning and saw where my friend Pam Buda (Heartspun Quilts) is at Back Door Quilts in Indiana!! Linda and Terri are the owners... we met them doing the show circuit vending. What great gals and it appears to be a gorgeous shop! What excitement seeing them on the monitor this morning!! Have fun you three!!! DO NOT get into any trouble. Let's check out what's for today!!! A passion of mine are OLD PIE SAFES.... the ones with the tin sides, front and back... take a peak at this one!! Here is a bit of "old" information for you.... The reason they have the tin sides... is to keep the flies out of the pies. These were actually used by the woman of the house. 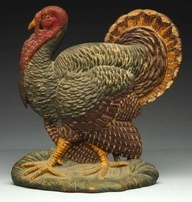 As she would bake her pies, breads, etc., she would sit them in the tin punched pie safe to cool. ONLY... the tin was turned with the sharp side OUT! Thus making the punched holes sharp and tiny... so the flies could not land and crawl through the holes! Isn't that clever? I think in all of my antiquing... I've only seen ONE with the tin still turned with the sharp side out. Most of the time when they are ready to sell them...they turn the tin the other way so no one gets hurt on it. This one is VERY fancy and could live in MY HOUSE very WELL!!!! 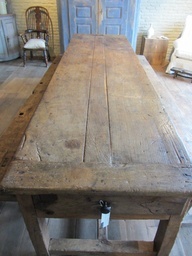 When attending antique auctions or antique shopping... my heart always skips a beat when I see wonderful old tables. This is a "bread-board" style...the pieces across each end - like they make bread boards gives it it's style name. Look at the size of these boards... REALLY WIDE - telling you it's an OLD table. I especially love the drawer at the end...those are rare in a table this size. 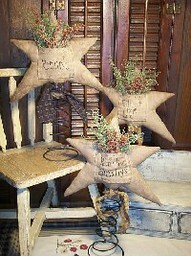 These bed spring stars have embroidery on the pocket then stuffed with greenery and berries. 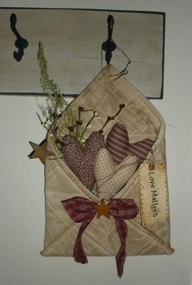 Here we go again.... a stuffed pocket with adorable hearts and it even has TWO rusty stars on it. How wonderful...this should be MINE! Oh My Gosh... you won't believe this piece! 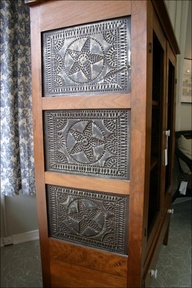 See the warp on the underside of this piece... that is not rug warp you buy... they have crocheted it!!!! 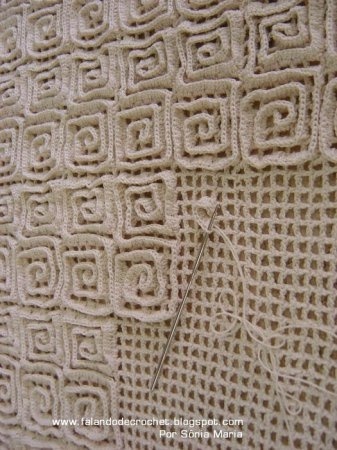 Then they crochet the design on top! How super wonderful is this! Here is the site... it's in another language but they have switched the critical part to English... Rug Instructions Who wants to make me ONE...just ONE??????? Now...this is pretty darn adorable too... check out the mouse sitting on top of the tomato holding a giant button!!! WAH!!! I want him too!! It's just not fair...not enough time in the day to work on all the things I would love to make. Here.... Give yourselves a hand!! HA! 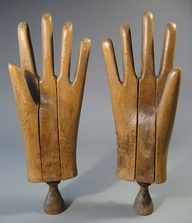 These are molds for glove makers. I think they are simply beautiful!! 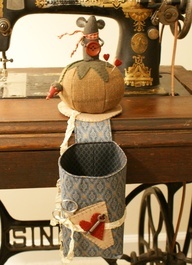 I'm off to sewing today.... I'm going to get my serger ready for a class I'm taking tomorrow to see how to run the silly thing! !